I never had such a thing. We were just nudged over across the field to where the high school was and expected to move on to gr. 9. Well, okay, we did have a dance in the gym from 3:30 to 4:30. Tonight, I went to my school's graduation because I taught these kids in gr. 3. Wow! What a big deal it was too! Is there something magical here that transforms them from kid to adult in just four hours? I mean the dresses, shoes with 4" heels, glitzy up-do hairstyles, and make-up were a sight to behold. On a few, it looked comfortably them, but for most, they were indeed struggling to pull it off. The girls have been practising how to walk on and off the stage in their new shoes for four days. A few were close to falling, but no one actually did. They were yanking up strapless gowns with no finesse and there were several tags I was dying to tuck in dresses! Someone definitely needed to work more with these awkward kids! Ah well, they thought they were great, their parents thought they were even greater, and they all had a wonderful night! And tomorrow, on the last day of school, as usual, the gr. 8's won't actually attend classes but will breeze into the building just to show off their hair and to emphasize the fact that they have grown up and are now beyond elementary school! It's a sort of right of passage handed down to them from the preceding class! Mother of Invention, their OLD Gr. 3 teacher! Escape From the Red Snake! I’ve been going to my post box every day anxiously awaiting the delivery of one of those many items I order through the mail. But this is no ordinary parcel, at least, not to me. Major metaphors involved! When I became diabetic at age 13, the whole big scary ordeal necessitated my wearing a medic alert bracelet to draw further attention to the fact. Now, to a teenager who had been forever fascinated with anything shiny that even resembled jewelry, (was I related to the crow family?!) this little "bangle" was a huge disappointment! This newest addition to my "pearls of possession collection" wasn’t exactly a real gem. Well, the information engraved was unique and I’ve always loved being unique but it was made of stainless steel for goodness sake! Serviceable, durable and ugly in the extreme! I was relieved to find that after a few months, wear and tear allowed the red snake to slowly flake off. Well, you can bet I hastened that process along with a sharp paring knife! Did I say these babies were durable? Well, in actual fact I’ve had about 15 break, get fixed, break again and so on…. 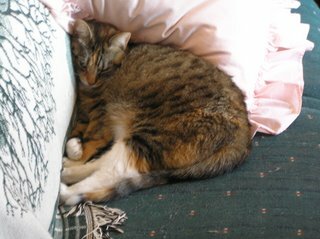 I found one buried in the snow, on the driveway after spring thaw, in my bed and in the bathtub. But the most ironic place of uncovering has to be at the summer camp for diabetic kids where I worked for 8 years. The following summer after losing it, I found it during a game of "Capture the Flag" while I was hiding out at the incinerator!! I bet there were many snake zap bracelets lost on the campground – on the bottom of the lake, under the dock, in canoes, in the horse barn, at the archery field, the campfire ring, the Chapel site…just about everywhere. Which brings me to the Sterling part of my story…. 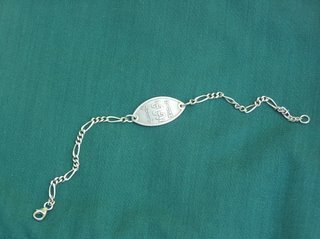 I have always looked wistfully at the gold and silver versions of these bracelets on the re-order forms, thinking they were just too much of a luxury for me to spend more money on than was absolutely necessary. Well, guess what? 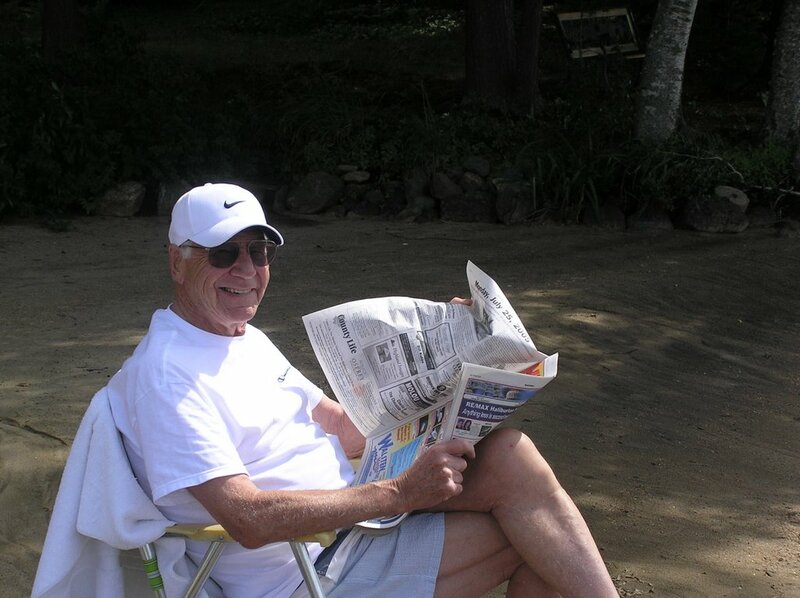 After 38 years with a red snake on my wrist, I decided that it was worth…..that I was worth it! Today it arrived in a box you’d swear was from Birks! (Okay, maybe that was just my enthusiastic imagination and keen anticipation at work!) It is like a pretty piece of real jewelry, smaller and a great deal shinier than the standard stainless! (A crow would be proud to wear it!) Even the chain is fine and delicate……$85 of Snake Power Zap! Mother of Invention, gazing at her new wristwear, gleaming in the sun. Well, now that I posted about all the loveliness of the first day of summer softly slipping in, I'm afraid I already have a complaint about the season I love so dearly! I was in my husband's office, relaxing on one of the chiropractic tables with a hot pack on my sore back when I couldn't help but notice this vaguely familiar, repetitive sound. I was trying to place it...it was just outside the window in our front treatment room, closest to the busy main street of our town. Aha! I had it! That same nagging sound we had complained to the town about last summer and the summer before that! They still haven't fixed it! Every time a car goes by, it makes this metal clanging noise. You lie there at night and wait for each car to go by and repeat the same effect. It's like when someone is snoring and you can't sleep because you're waiting for the next snore to happen! You'd never notice it in winter because of the snow-covered roads and our closed windows. Yep, the town just has to fix that loose man-hole cover! AHHHH!!!! Mother of Invention, trying to get to sleep! that has softly slipped in. I copied and pasted the comments into Word and printed them for him to have, but if anyone knows how to print the comments page, please do tell!! My whole family gathered in our backyard for an amazing afternoon ...lots of hugs, chatter, and the ususal raucous laughter! We all have an incredible sense of humour and fun, thank goodness! It was extremely hot and humid, but only a few minutes of the rain they predicted had a few retreating indoors. The outdoor bar was opened upon the first family's arrival as is the tradition. We were treated to Uncle Bill's claim to fame guacamole dip, and my cream cheese salsa dip. Steak was perfect, (Yah, Dave! No burnt offerings this time!) as were the bean, potato and caesar salads! Fresh baked buns were superb and the piece de resistance, was the dessert, my mom's cherry cheesecake and mother-in-law's key lime pie. Cherry and blueberry pies were on hand as well. Lots of digital cameras were covering the event, but as always, the premium coverage lies somewhere deep in my heart, in full colour, zoomed in and blown up, for eternity! Mother of Invention, not thinking, but knowing I have the best family in the world. When my father traveled to Israel on a Canadian Trade Mission in 1967, he was particularly interested in visiting a Kibbutz. He was quite moved by the sight of the young children in the kindergarten who lived apart from their parents on these communal farms. I remember the slide he had taken of the little pairs of red shoes lined up on the bench in a hallway. He must have reflected upon this image as he wrote this tender story on the flight home. Her name was Nurit, just a name chosen at random by the teachers of the Kibbutz. She never knew her father, who was struck down one evening by a truck, swerving suddenly to avoid a donkey cart on the side of the narrow highway leading to Bersheba. Her mother only saw her baby once before she, weak from complications, and with a broken heart, passed on to join her husband in the Garden of Eternity. Nurit was now four years old, a strange child with deep, dark eyes, which would change as quickly as a flashing light from burning interest to quiet pools of secret longing for something that she would never know; the gentle glance of a mother’s understanding or the soothing comfort of a father’s knee. This little girl was of course, the teachers’ favourite among the eighteen children. One teacher would usually hold her hand when all the other kindergarten kids would run eagerly off, in their little red shoes, after the supper hour to play and visit for a short time with their parents. It was then that Nurit’s eyes would become most empty and still, and she would remain for a few moments, silently watching by the door, hugging her rag doll, her thumb always in her mouth at these times. Her eyes would light up briefly when the others would return to talk, as only four-year-olds can do, of their adventures of the evening. Later, when darkness would come with the suddenness of the eastern night, and the others were sleeping, Nurit would lie awake on her small bed, and looking out the window at the stars, would murmur quietly to herself, "I am visiting with my Mommy and Daddy." Then she would drift into peaceful sleep, a wistful semblance of a smile tugging at the corners of tiny mouth, while outside on the veranda rack in a neat row, rested eighteen pairs of "little red shoes". One evening during the visiting period, Nurit became even quieter than usual. One of the teachers had gone to the library and the other was working on some new charcoal drawings for the next day’s classes. Suddenly, the child slipped without a sound out of the door and ran through the orchard, so fast that she seemed to fly through the darkness between the great rows of olive trees. Emerging on the other side, she still ran, stopping finally, panting beside the edge of a deep "wadi". It was here, in such a strange place, that she became frightened and whimpered for the first time, as she tried to catch her breath. Looking quickly toward the orchard, she, in the terror of the moment, felt the branches of the trees reaching out to her with crooked arms. She took three steps backwards and dropped quickly over the edge of the "wadi", swollen from a sudden afternoon rain, and was carried away by the rushing torrent of water. The next day, three kilometres downstream, they found Nurit as the waters lowered, still clutching her little rag doll. When that evening came, her tiny body had already been buried, as is the custom. Night, and the moon shining down on the veranda of the kindergarten of the Kibbutz by the Gaza, down upon seventeen pairs of "little red shoes". But high above, so the story is told, amid the countless stars of heaven, running straight toward the two brightest stars, which twinkled even more quickly and happily than the others, were two little red shoes. And below, the children were sleeping peacefully in their beds, but no one was watching the stars from the empty bed by the window. You did it again, Dad. I get tears in my eyes every time I read this. There are not many people who would be so moved and compelled to write about such a precious moment. Thanks for sharing with us your great sensitivity to all that you experience in this world. Mother of Invention, still vividly seeing the teacher lining up those little red shoes in your slide. As always happens with these celebrations, I am asked to get up and do "My Roast-Mimic Thing" I love doing! I am told that I am so funny that I should be a stand-up comic. I don't really think so, but it's just so natural for me to "honour" and celebrate who people are with a light-hearted, affectionate, roast-type presentation. To imitate the person in situations the way people really see them is just pure fun for me! It is so neat to see anyone see themselves and laugh! To me, this is an important aspect of life..to be able to just poke fun at yourself, get a kick out of who you are, and then love yourself all the more. I had particular fun with this gal's because she has so many interesting and truly funny facets of personality. Indeed, I had a ton of good material to work with so it practically wrote itself! Her husband was there and it was neat to see him, as well as everyone else in the room, just breaking up every few minutes. I think he caught a glimpse of her "other life" and how others see her, appreciating her all the more! This is always an important thing for a spouse or partner to see. It was really gratifying for me to have done such a unique contribution to the program and once again, I had affirmation that I am a valuable member of the teaching staff. Everyone needs to feel that they are all part of the whole team, on board the same ship together. 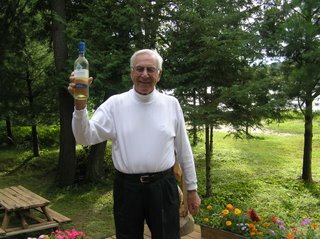 To all retiring teachers out there, have a good one! I hope someone honoured you in a special way. Mother of Invention, thinking, I'm right behind you....in 3 years!! 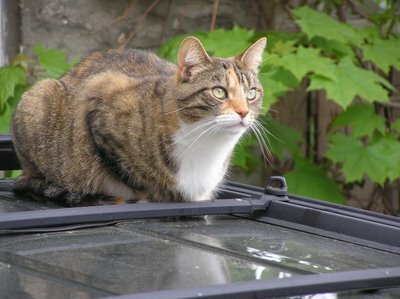 My cat, Socks, is definitely in her spring/summer hunting mode! In this picture, she is seen in her favourite perch, on top of our Pathfinder, scouting the skies and the next door neighbour's roof for birds! Well, my husband learned the lesson of "checking your cat's mouth before you let her in" big time, yesterday! It seems she had a huge Downey Woodpecker in her mouth, which she promptly let go as soon as she entered the house! A quick trip down the stairs and the "Catch and Release" protocol of bird-hunting was observed as the woodpecker was "Shown the Door"!! Whew! All this in a three minute time span! Everything was unscathed, oh, except for the oak staircase which was christened with fresh bird poop! Can't say I really blamed him...and my husband redeemed himself by wiping it up! Mother of Invention, doing mouth checks religiously now! Dedicated to my sister, Joan, who is braver than I am! Congrats on your new "do"! I turn away when I have to walk past hair salons. My hands shake as I pick up the phone and dial the number to book my annual appointment. There is a definite quaking in my entire body as I reluctantly open the door upon my arrival on the dreaded date. My voice cracks as I report to the receptionist that I have indeed shown up this time in hope that the outcome just might be better than the previous visits. I wistfully leaf through the pages of glamourous hair magazines. Is it possible that someone in this shop could get me to look like that girl? My spirits lift slightly as I watch and admire my stylist’s last client at the counter, a gorgeous redhead, who pays and generously tips for today’s creation. When my name is called, I rise, nervously clutch my purse and warily follow the girl to the chair at the sink. Then, predictably, comes the age-old question, "So what would you like me to do with your hair today?" (As if she could do anything!) It is all I can do to bite off the response, "Well, not much really, a simple cut like Cindy Crawford’s would be fine!" Instead, I make my usual reply, "I’m not really sure. Think of my hair as the challenge of your career." She lightly fingers my hair, drops it abruptly, and remarks disdainfully, "I see what you mean. There’s really not much we can do with such thin, straight hair but I could try a perm." "Oh no!" I think. "Now there’s a loaded word!" The mere mention of the word "perm" dredges up painful, terrifying memories that stem from early childhood. It brings back tears and fears of frizzy days gone by. Recollections of being called "Harpo" by the boys in my class flood my mind. I remember with horror, the many repeated visits to the hairdresser’s to ensure my perm took the second time. I should demonstrate my assertiveness training and state emphatically, "No! A simple blunt cut is all I want!" I could throw all caution to the wind and let, yet another hair stylist have free rein with my locks. In the end, I wimp out. (I didn’t actually go to all those classes!) My power of positive thinking weakly struggles to the surface to state once again, that it will turn out all right this time. "No problem." she replies. "We have a new one that’ll work great." I groan inside. Shades of the computer perms that did not compute or got a virus and died a sudden death at the hands of some very sharp scissors! Patiently, I sit through the familiar stages of the "salonized perm" and silently worry if it will be too curly or not curly enough. I sneak a look at the new me and think, "Not bad! It definitely took!" And then, as always, I wonder how I will ever be able to employ the tricks she has just shown me to re-create the same effect? That is the crux of the matter. You can look fabulous when you leave the salon, having just over-tipped them in your excitement. But what about when you are left to your own skill to attempt it yourself? And true to form, only three days later, I stand helplessly before the mirror and am tearfully thrown back in time to one horrific poodle cut! "I can’t believe this! It’s happened again!" I complain to my husband. "When I waltzed out of that place everyone said that I could have been on the cover of a magazine!" My husband mutters and thinks that I can’t hear, "Yeah, what they didn’t tell her was that they meant, "Dog Digest Magazine"! I take another look and sadly resign myself to the fact that I do bear an uncanny resemblance to the family canine. For the time being, I decide to enter the "Pet and Owner Look-alike Contest". It will only take seven months for my perm to grow out, almost in time for my next hair appointment! Mother of Invention, kinda glad my hair is long again! What's Up With That Wind? Some fierce gales you were yesterday! propelling them out of the way! "What Shapes Do You See?" Were you in a hurry to get somewhere? Where do winds have to get? You don't punch clocks, do you? Did you like the effects your power you had? And are you now where you were so urgently headed? Mother of Invention, wondering what was up with that wicked wind yesterday?! It is said that those who are trying to find their way, look for an Inukshuk, the figure built of stones in the folklore of the Inuit people. If you are lost, the arms of the Inukshuk will point the way home. 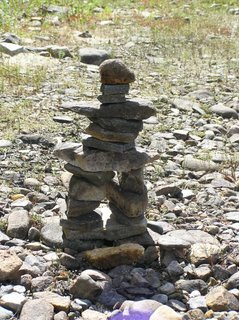 We all get a little lost along the way sometimes and look for the Inukshuks in our lives -- our signposts to guide us back. These can be simple events in our lives or even in the lives of others. It could be something someone says or does that just grabs you and does not necessarily have to be the words or actions of a significant person either. The smallest of things could be the most pivotal in effecting a change that brings us to the road we need to follow, whether that be the old road from which we strayed, or a new road altogether. I love the symbol of the Inukshuk and had been looking for one on a necklace for several years. The very idea that if I wore one, I might find my way a little more easily, enchanted me. What a wonderful surprise when a really close friend gave me a shining silver one for my last birthday! It was a truly touching gift and I cherish it, although it has yet to work its magic!! Maybe it’s because I haven’t built my own yet. 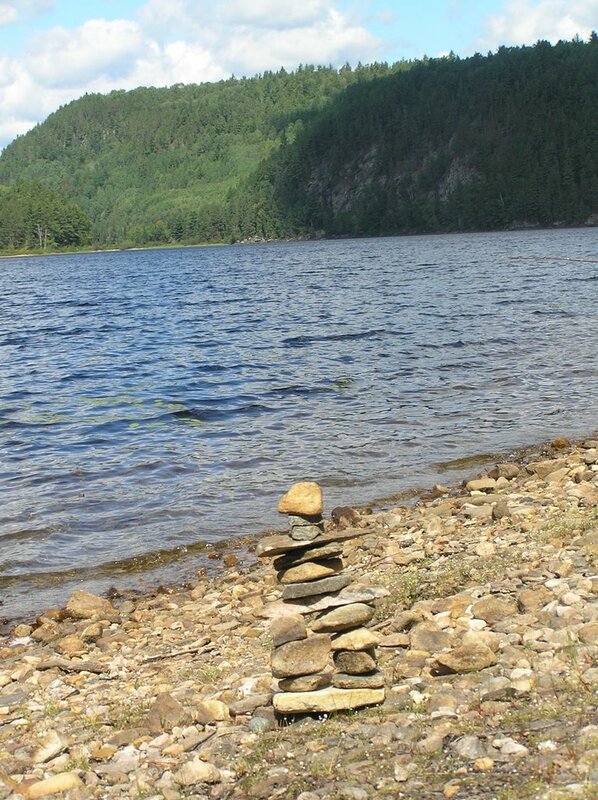 My goal was to build a meaningful Inukshuk out of the stones I brought back from my favourite summer place on the shores of the Dumoine River. For some reason, these carefully picked stones are still in bags in the pantry. I guess I need help to construct and fit the individual stones where they belong, and I am a little shy of the hot glue gun! 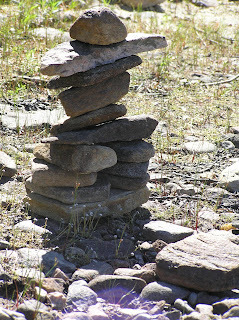 Perhaps the Inukshuk struggles as I do to find its way, having found so many roads for others. Who or what will guide it? Maybe we all play a part in showing each other the way. 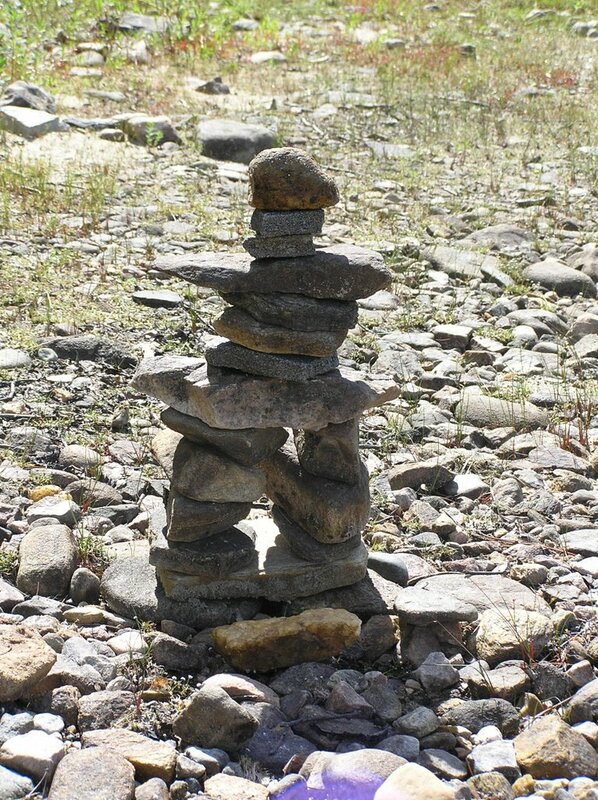 The Inukshuk may show me that I should continue helping and teaching others of all ages, and simply keep being there for my family and friends. It will probably tell me to keep sharing my kindred spirit with everyone; my humour and laughter, my songs and stories, my strong reflections and ponderings, and my keen sense of wonder about the many things in this world. The natural empathy I have endears me to many special people. It draws me in, creating a powerful thirst and desire to connect closely with them for a time so that I can feel that I play a purposeful part of their lives. I like to travel on this familiar road. But sometimes I wander and lose my way or maybe the road loses me. 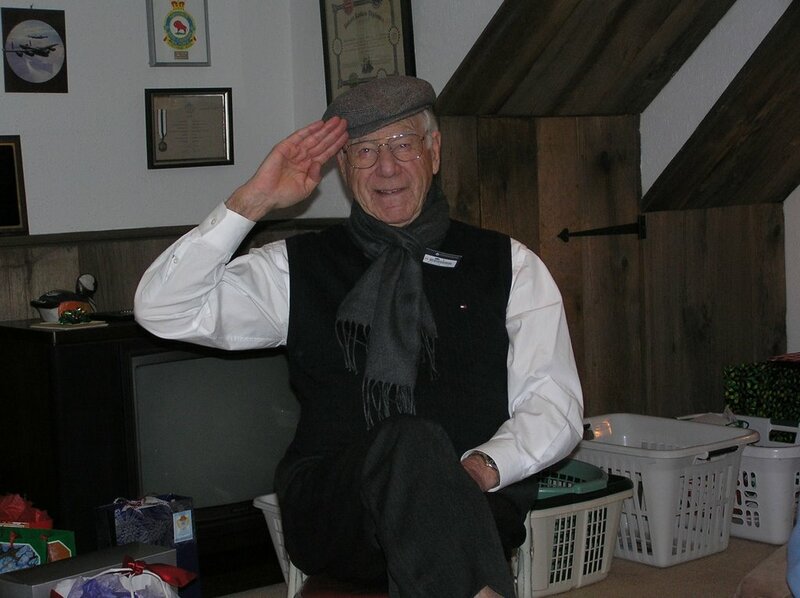 And when I feel sad and sense that I am merely watching everyone from the periphery, dancing their daily lives, I hope an Inukshuk or someone with the same guiding spirit will beckon and show me the way into the centre of The Circle to share my own dance, and perhaps even join in one of theirs for a time. 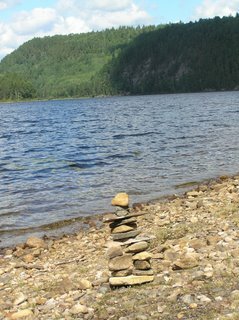 I built these inukshuks at my favourite summer place on a beautiful river known for its white water canoeing and fishing. I packed them up in bags, brought them home and still have not re-built them! They are one of my favourite symbols. 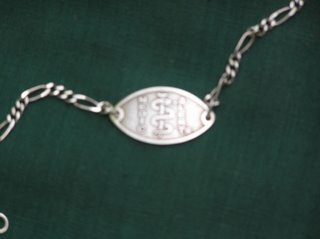 I have a necklace and earring set of these and every time I wear them someoneone remarks on them. Not long into the massage, she noted that she'd never felt my muscles so tight and with so many nodules. There was my clue. At once, I put it together and was instantly deflated. How pathetic! Toned up? What a cruel compliment! I just had so many spasm nodules linked together all the way up my spine, that they presented just as if I were a regular buffed-up get-fit exercise fanatic! And it seems that these toned-up in-shape knots gave plenty of resistance to her efforts. As she wiped the sweat off her brow with a towel and left the room, she looked back saying,"That was the toughest workout I've had all week. Brutal, in fact." And then I heard her slowly dragging herself upstairs, each foot emphatically punctuating her fatigue, one step at a time, leaving me dejected and painfully wishing a huge crane could hook me on and lift me up off the table! How Do You Like Your E-mail? I used to hate e-mail! I can't believe how my thoughts have changed because I sure do spend enough time at this machine doing it. And in the end, it might be what we choose….. But I wish we’d consider what we're to lose…. Last night I was absolutely wiped after a challenging cardio workout in the morning. We slept in our summer bedroom, my favourite room in the whole house! It is a cottage-looking room on the second floor up in the trees and overlooking the river at the end of the backyard. The temperature was 14 degrees celsius, the windows on all 3 outer walls were wide open, and the beautiful fresh air breezed in the perfect sleep for me. Coffee is made and I'm on my way to the outside balcony that is attached to this enchanting room to enjoy the sunrise and the good morning songs of numerous birds. 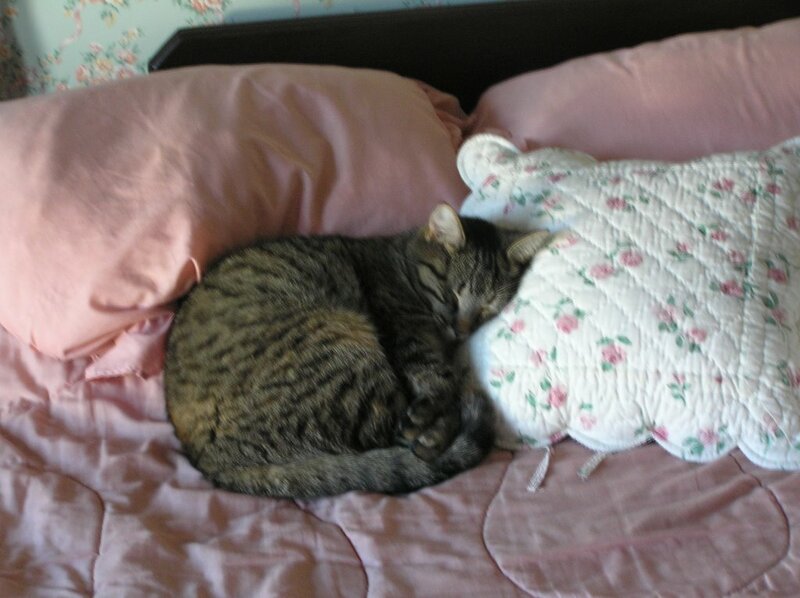 I have always envied how easily and peacefully my cats can slumber for hours on end. Last night, I think I previewed my next life! Tomorrow, I swear I'll do it. I've left it long enough. "IT" has been staring me in the face since the week before Christmas when I got sick and I can't win this staring contest! "IT" is sitting immobile in the heavy black case on the computer/nature room floor with no life in it whatsoever and I must do something to revive it very soon! In fact, today's the day I've decided to make it happen. My guitar is coming out of its case! I am going to slip on a thumb pick and just start strumming to whatever song comes to me. I need to practise my chording and build up those callouses on my fingers once again. That's a slow process which takes a few weeks. The cute songs I play for Gr. 1, 2, and 3 music classes will be rehearsed several times before I am ready to go and visit the kids I haven't seen since the end of first term. My confidence must be re-built and allow me to enter that familiar room. Can I do it? Will I even remember all their names? Mother of Invention, hearing the kids' favourite song, "Peace Like a River", over and over in my head! What will you bring to life today?! to ferry us to ours. shouting expletives all the way. and vowed they'd go when it let up. If it rains long enough on your heart, does it rust? Does it get "flooded", unable to start again for awhile? Mother of Invention, still listening to severe weather warnings! Just went out to my backyard and am sad to report that my lilacs are definitely on the way out! Most have at least 1/4 of the blooms brown. What is left still smells great. Unfortunately, the Lily-of-the-Valley are all gone too. I love their fragrance and constantly wonder how the Coty company gets the Muguet de Bois perfume to smell just like the flower? !They barely lasted a week! However, those Forget-Me-Nots are still perfect! They've been in suspended in full bloom for what has seemed like a month already and show no signs of waning. 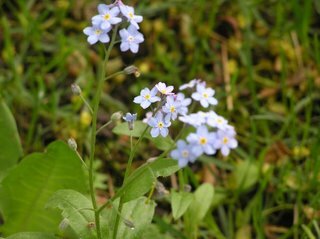 I love these delicate and feminine blue flowers too. They look like they belong on a calico dress or on some pretty bedroom wallpaper! Mother of Invention, anxiously awaiting the Peonies!